Some days you just gotta wear jeans and a t-shirt, and here's how to rock it. 1) Don't stick with just any plain white tee. Try to find a t-shirt that has longer lines than your average white tee. I chose to go with a more slim cut shirt with longer sleeves. This gave the outfit a more fitted look. 2) Jeans that you love. A good pair of jeans that last a while is hard to find on a tight budget. Even denim jeans from Zara usually start at about $79. Finding a pair of blue jeans that you love, and you know you will wear often, is a must. However, spending $300 for designer label jeans isn't a must, or a that great of a long-term investment. The brand 7 For All Mankind is where I shop for my basic jeans. 3) Accessories and Shoes. You still want to keep in mind that the look you are creating is a simple jeans and a tee combo, so when choosing your accessories you want to stick with the basics, and neutrals. I have been in love with neutral sandals this summer, and picked these up during Men's Fashion Week during a rain storm. And, they have turned out to be one of my go-to shoes of the summer. With this look I also added my Hermès leather belt to create some modern edginess and add a subtle pop. 4) The Sunnies. I threw on my Ray-Ban gold aviators because they contrast nicely with the white tee, tie the belt into the look, and make this look feel a bit more polished. 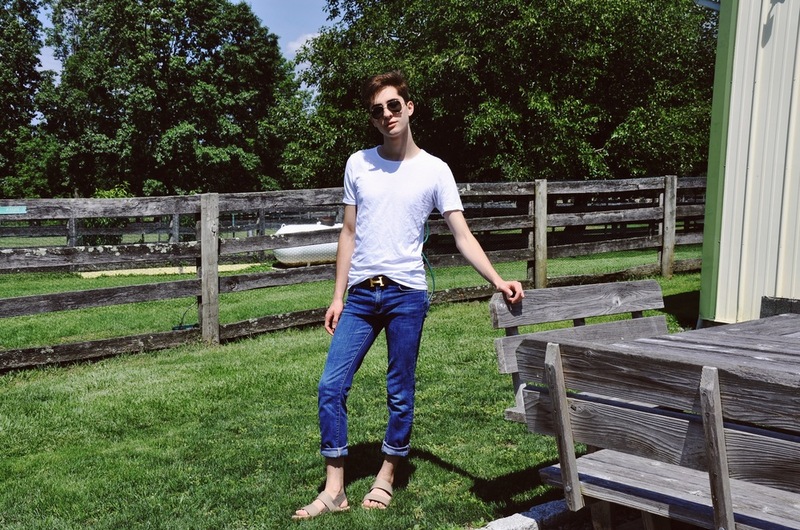 In this look... Ray-Ban aviator sunglasses, Zara basic white Longline t-shirt, 7 For All Mankind blue skinny jeans, Zara neutral sandals, & an Hermès leather belt.